The military officer in one of the widely circulated Kalyppo selfies on social media is under investigation by the Ghana Armed Forces (GAF) for possible breach of regulations, Army PRO has said. Colonel Aggrey Quarshie told Myjoyonline.com Wednesday that Private Osei Owusu of the Ghana Military Police is responding to questions regarding his act which is deemed as an affront to the Armed Forces Regulations Act of 1962. He explained that pictures taken using “military accoutrement” are technically the property of the Ghana Armed Forces (GAF), saying officers who want to use them for personal purposes must apply for clearance. “Your picture does not belong to you and you are not supposed to do anything with it,” he said. 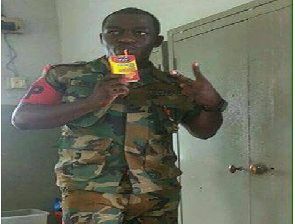 A picture of Private Owusu dressed in his military police outfit clutching the Kalyppo drink circulated social media, barely three days after a picture of the flagbearer of the New Patriotic Party (NPP), Nana Addo Dankwa Akufo-Addo sipping the fruit juice went viral on the same platform. Attacks by political opponents on the NPP leader’s picture led to one of the biggest challenge in terms of response on social media. Nana Akufo-Addo was accused of sipping a drink made for children. This triggered a sharp response from supporters and functionaries of the NPP who serenaded social media with their pictures while taking the drink in what has become the #Kalyselfie challenge. They solidarised with their leader. When the picture of Private Owusu sipping the drink made its way to social media, some social commentators were worried that he would be isolated for victimization considering the nature of Ghanaian politics. Others argued to the contrary that he would not be punished for doing what does not amount to a breach of GAF rules and regulations. But Colonel Quarshie told Myjoyonline.com’s Austin Brakopowers that a picture considered harmless by the public might end up stripping the GAF of its integrity and professionalism, key attributes the Army needs to survive. He said one of the reasons the military personnel is being investigated was because the timing of his picture coincided with a political event and people might consider that as a declaration of his allegiance to a political party. The GAF said per Army regulations, military personnel is not permitted to take sides on issues relating to politics, and those who do that need to be sanctioned. “Election duty is coming and what if you are leading a party and team members realised you belong to party A and they belong to party B what do you think would happen?” he asked, adding anything that brings the name of the GAF into disrepute has to be stamped out.